Sciblogs | Antarctic Voyage: Could the past be the key to the present? Antarctic Voyage: Could the past be the key to the present? Written by Molly Paterson (PhD student, Antarctic Research Centre, VUW). Over the last week, while the oceanographers have been studying the hydrology of the slope, the geologists have recovered two cores. 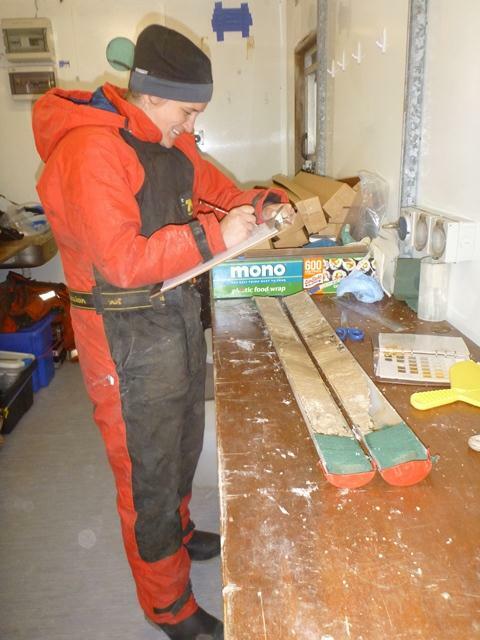 We hope that by analysing the sediment in the cores for different proxies (see blog post 8: The geology team and coring) we will learn about past changes in the Antarctic bottom water formation and flow over glacial/interglacial cycles (several hundred thousand years). I am a PhD student from the Antarctic Research Centre, Victoria University in Wellington and interested in much longer time scales. I am studying the evolution of Antarctic Ice volume throughout the Cenozoic (the last 65 million years). My PhD focuses on understanding of the physical mechanisms driving Antarctic ice volume and the downstream influence on bottom water circulation and sea level change. A central question facing society today is what the potential implications of anthropogenic global warming on Earth’s climate system are. In order to help answer this question, I am examining Earth’s history during periods when atmospheric CO2 concentrations were similar to today, and global mean temperatures were in the range of those predicted by climate models for the end of the century. The Pliocene Epoch (~5.3 to 2.6 million years ago) represents the last time Earth’s climate met these criteria, particularly the warmest interval from 4.3 to 3.0 million years. Geological drilling by the ANDRILL program (ANtarctic geological DRILLing) documented frequent collapses of the marine-based (i.e. grounded below sea level) Ross Ice Shelf, part of the West Antarctic Ice Sheet throughout the Pliocene. The Wilkes/Adelie Land region of the East Antarctic Ice Sheet, the region which includes the Mertz Polynya, is also largely grounded below sea level. It has therefore been suggested that this region of the EAIS will be sensitive to similar processes regulating the WAIS. It is thought that the melting of these marine-based ice shelves is dominated by warming of the ocean temperatures – resulting in melting from below – with only minor contributions from the warming of the atmosphere (melting from above). Part of my PhD focuses on understanding the processes off the Wilkes Land margin by looking at data from sediments in long drill cores that were collected by the Integrated Ocean Drilling Program (IODP) in 2010. We are interested in what the sediments can tell us about changes in the ice sheets and their sensitivity to insolation changes (solar radiation – heating by the sun). The sensitivity of the ice sheets to insolation appears to have changed as the Earth went through a relatively warmer period with higher atmospheric CO2. So it is great to visit my study area during the voyage and get a feel for what the modern system is like. It has been good to get some hands-on field experience of marine geology – especially coring. I also hope to learn more about the polynya system from the oceanographers on board, as it is central to understanding the stability and changes in the ice shelves. This voyage is in stark contrast to my previous field work. This time last year I was sleeping in shearer’s quarters, dodging cows and sheep, tramping through rivers, climbing up, down and over Pliocene rocks in order to collect geological samples in the Wanganui Basin, New Zealand. These rocks provide a record of sea level changes, which were up to 7 m higher during the warmest Pliocene intervals. These sea level changes are directly linked to the ice sheet, and associated volume, changes we see in the cores from the Wilkes Land margin, Antarctica.